Governor Peter Shumlin formally recognized two bands of the Abenaki Indians at a ceremony outside the Statehouse Monday. Shumlin signed a bill recognizing the Missisquoi band from the Swanton area and the Koasek band from the Newbury area. Shumlin says the law recognizes the Abenaki’s contributions to society. "We’re here to celebrate evolution in the cause of civil rights and progress in the state of Vermont," Shumlin told a crowd gathered on the Statehouse steps. "It’s a great honor to be here." For years Vermont did not formally recognize any Indian tribes. But the Legislature set up a system a few years ago, and now the Nulhegan band in the Northeast Kingdom and the El Nu band in the Windsor area have also been recognized. After years of fighting to be recognized, some members of the Abenaki Indian community have been officially acknowledged in Vermont. 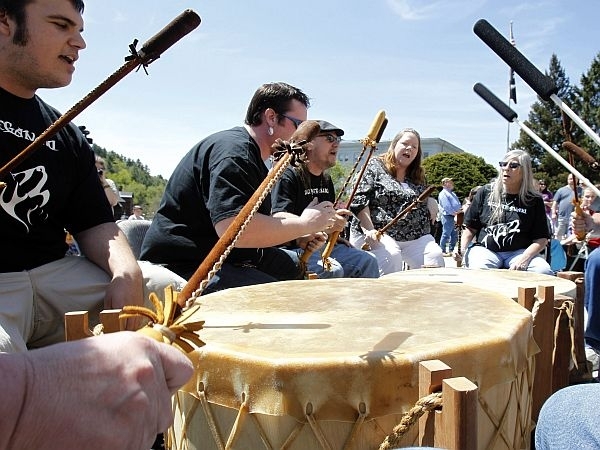 Governor Peter Shumlin signed bills on Friday that grants state recognition to the Elnu Abenaki and the Nulhegan Band of the Coosuk Abenaki nation.